Errrrr…Give me a second please! Now picture yourself dining in a restaurant that serves unfamiliar cuisine. You can read the menu (with full descriptions). There are also other customers around you, some are frequent visitors. You are also allowed to visit the kitchen to see the masters behind the delicious food. 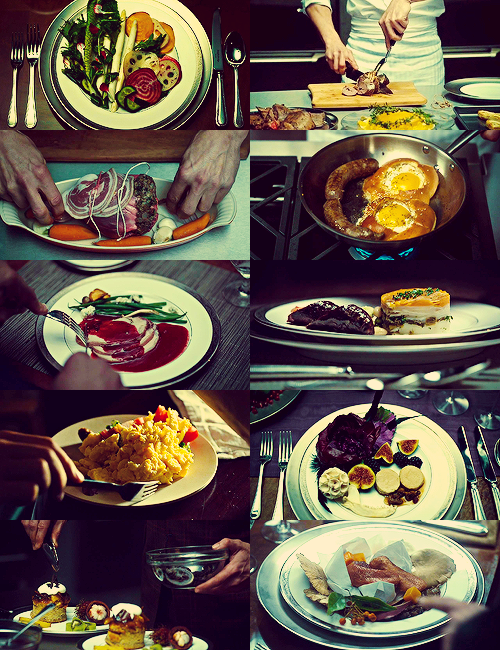 Which dishes would you choose for dinner? You noticed this restaurant has a special feature: you are allowed to sample a great many dishes before the server takes your order. The best way is probably to take a sampler platter, and taste all the interesting things on the menu. Be aware, too much sampling can lead to a full stomach, which leaves no room for the main courses. Choosing a major is just like taking a savory journey in this lovely restaurant (but with a lot more time to sample the food. In my case, I had a year and a half. First, you can think about the subjects that interest you, and take a look at the course catalog (the menu). If you are not so sure, no worries, freshman year is here to the rescue! There are usually wide ranges of interesting classes to choose from for freshman. Be brave, and take a few classes that look intriguing or you never heard of (you are usually allowed to drop a class at the beginning of the semester without penalty). The above figure is a real life “menu” offered by Wesleyan University. 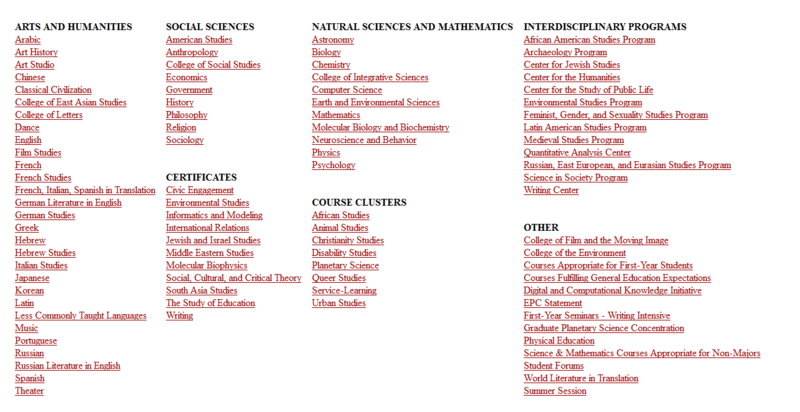 It shows all the possible majors you can choose from. There are three major categories, excluding certificates and interdisciplinary programs. Under each category, there are roughly more than ten majors (well, Arts and Humanities alone has more than twenty). Under each major, there are numerous classes, and their numbers are changing constantly from semester to semester. Excited, but befuddled? Me too. Therefore, one of my most grateful college experiences was that I didn’t start college with an assigned major. I didn’t know what to major in anyway (look at all the options listed on the menu!). My school (Wesleyan University) gave me a year and half to explore my options, and declare a major (or majors) at the spring semester of my sophomore year. If I was not ready, I could have more time. And of course, dropping a major is allowed. All I am trying to say is, colleges usually have a flexible system, give students enough freedom to explore their interests, and (hopefully) maximize the chance to find the most suitable major(s). Now here comes the big question: how do you choose a major (or majors) in college? I would like to share some of my experiences and hopefully can make your life a little easier when the time comes. Upon graduation, I gained a double-major degree in Chemistry, Molecular Biology & Biochemistry (MB&B) with a Biophysics certificate, and a minor in German Studies. During the college years, I thought about declaring majors in Art Studio, History, Film, etc. Trust me; this only looks like a lot, because it only involved a lot of thinking and planning (not too much action). I was allowed and greatly encouraged to take a broad range of classes in my freshman year, and I had an advisor who truly cared about me. My first year schedule was roughly as follow: Personal Identity and Choice (Philosophy), Drawing (Studio Art), Intro to Biology, Intro to Chemistry (Science), Chamber Music (Music), and English Essay (English). I was going to take more classes (I wanted more than 4 classes per semester), but my advisor, Professor Randall, stopped me at all cost. I thank her eternally. Taking 4 full-credit classes each semester is just the right amount of work I can handle properly. There are always more things to learn than just classes, especially as a freshman. Taking a class or two is just like sampling the major these classes belong to. After my first year, I learned that my interest lies heavily in my science classes and art classes. The problem was that both subjects demanded long hours spent in lab, library or studio. After a semester of trying to take gateway classes for both majors, talking to professors and academic advisors (masters in the kitchen), and upper classmen (frequent customers) who double-majored in both, I figured it was too hard for me to keep up. I went back to my advisor, and she said, “You can always take relevant classes if you are interested.” Giving up on a major doesn’t mean giving up on my interest. When the time comes, I didn’t declare Art Studio major, but Chemistry and MB&B double-major (these two majors are closely related to each other). I felt like this was a better choice for me, for I could only take the art classes that interested me the most, without the frustration of fulfilling graduation requirements for the major. After the initial struggles, I learned my way around the system, as well as my limits. Throughout the years, I was always able to take classes I love outside my own majors. I let my interest guide me through the course map, and in my senior year, I surprisingly figured out the amount of German Studies classes I took gained me a minor in German Studies. Back in my freshman year, I never even thought about doing anything related to language. This is how I found my majors. Hope my experience will give you some hints.